Some special considerations should be considered when placing a refrigerator in the garage. Most manufacturers do not recommend garage refrigerator use below 55 F. In an unheated garage during periods of freezing outside temperatures, the freezer portion may actually warm and thaw frozen food. Additionally, the refrigerator portion may freeze your food. I prefer to use the garage fridge primarily for beverage storage and the occasional overflow of a mega shopping trip. Enjoy garage fridge food first whenever possible. Store your leftovers and highly perishable foods in your kitchen fridge. If you still have it, read the owners manual! The manual should list safety, operational and cleaning tips. Never store flammable objects near the refrigerator. Compressors, fans and motors can cause sparks and ignite flammables. Garage electrical outlets may be attached to a GFI (ground fault interrupter) circuit. If your refrigerator has to be connected to a GFI protected circuit, you may want to think twice about food storage. GFI can trip and disable power to the fridge causing a perishable stinky mess. Always use a properly grounded wall outlet and refrigerator power cord in good condition. Make sure the insulation is not cracked or cut. Do not connect the fridge to a switched outlet where it may be accidentally switched off. 1) Place the thermometer in a glass of water in the middle of the refrigerator. Keep the fridge door closed overnight and check the temperature the next day. A safe temperature range for the refrigerator is 33° F to 40° F.
2) Check freezer temperature by inserting the thermometer between frozen food, such as packs of frozen vegetables, and check after several hours.The freezer temperature should be between -5° F to 5° F.
3) Adjust the controls to maintain proper temperatures. Keep the refrigerator clean. Clean the coils frequently by vacuuming them. This saves energy and assures peak operation. Apply automotive wax to protect metal surfaces and use household cleaners to remove mold and mildew. Pay close attention to this on the door seal where mildew frequently grows. Do not block airflow around fridge. Placing cabinets or large objects directly against the refrigerator can block the circulation of air the refrigerator needs for proper operation. Place the fridge a fair distance away from heat sources such as the hot water heater. If your garage refrigerator is equipped with a power/energy saver switch, you should have it in the ON position in the summer and OFF position in the winter. This switch works as an anti-sweat device for reducing moisture content during summer months. Follow these important tips to increase the longevity of your refrigerators service and to keep food from spoilage. 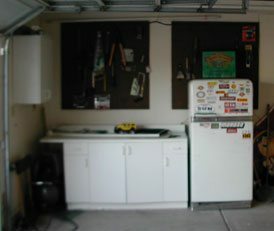 Advice on refrigerator use in a garage environment. Temperature fluctuations in a garage can mess with the performance of your fridge. Certain precautions should be taken to avoid food spoilage in a garage refrigerator.